Lisa Garland has big plans for her grandparents' wedding anniversary on December 24th - the grand opening of Carousel House, featuring a fully-restored carousel in downtown Christmas Town. 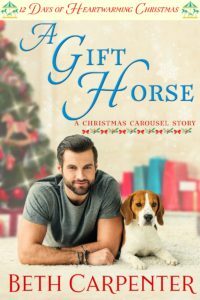 She doesn't expect the company restoring the carousel to go bankrupt or the only man available to help her make the deadline for her grandparents' anniversary to be her ex-fiance. A decade ago, John Richardson walked away from Lisa for her own good. He's tried hard not to look back. But now Lisa needs a miracle and John might just be the only man who can deliver it. If only he can keep his undying love for her a secret. He's scheduled to return to duty on December 25, so all he needs to do is organize volunteers to finish the carousel and keep his heart under lock and key. 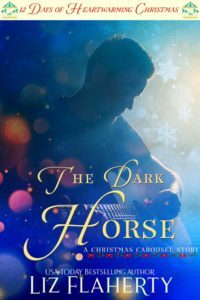 But love has a way of opening doors and hearts, and John's holiday season may not go as planned. 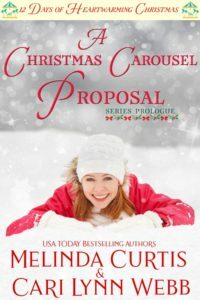 A Christmas Carousel Proposal introduces many of the characters in the 12 Days of Heartwarming Christmas series, which begin the week after John proposes to Lisa. Six romances feature Lisa’s bridesmaids and six feature heroes working on the carousel. All full-length novels end on Christmas Eve. Ross Delaney and Mia Thompson were such good friends that they went into a painting business together. Ross appreciated trained artist Mia’s ability to bring color and texture alive, and he celebrated her successes. Mia learned from Ross’s innate ability when he achieved beauty she couldn’t explain with all her training. They didn’t expect to fall in love, and they were both shattered when they went their separate ways as their goals diverged, but the business emphasized the differences they’d been painting over in their relationship. Now, they’re working with all the other artisans in Christmas Town to restore a carousel as a gift for a beloved town family. The deadline is Christmas Eve—the night when a kiss under the mistletoe means a wedding in the new year. Can Mia and Ross paint their second chance into being? Luke Mueller has his reasons for keeping to himself, and his neighbor, Gwen Heatherton, is one of them. But when Gwen requests his expertise to help restore the Christmas Town carousel, he agrees to pitch in. In between replacing gears, dog-sitting a wayward beagle, and working alongside Gwen to bring the carousel’s organ back to life, it’s just possible that Luke’s Christmas spirit may be restored as well. Widower Dominick Decker needs to win over his in-laws so they don't challenge him for custody of his daughter Jessie. He's never lived in Christmas Town before and only moved there because of his wife's last wishes. A second generation heating and air conditioning repairman (who's trying to fix the Carousel House quirky heating unit), he doesn't understand why Christmas is so important to everyone. You put up a tree, you buy gifts (gift cards, really) and buy a pre-made turkey dinner from the grocery store, making time for service calls in between. What more do you need to do? A lot more if he's to win over his Christmas-loving in-laws. Enter Ruby Caldwell, owner of Santa School and trainer of "professional" Santas. 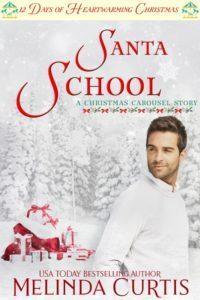 She's run Santa School seasonally at night the past few years, but now she's being laid off from her day job and she needs Santa School to be year round. That requires a positive mindset, along with a lot of creativity. So she decides to branch out with Elf School to train dads like Dominick how to put on a great Christmas by themselves. Sound easy? All you need are a few willing dads (no Doubting Thomases...or Doubting Dominicks) and a don't-quit smile. Let's hope Ruby's smile holds out this holiday season. Widowed Chloe Brewton has made a life for herself in Christmas Town, Maine, teaching literature and being the drama coach at the high school. 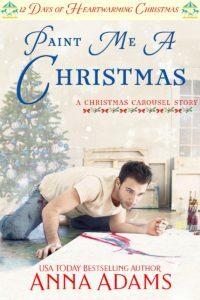 Although she’d loved her husband and their life in the army, she doesn’t really want to start over with someone else, but when she meets Major Row Welcome, in Christmas Town to spend the holiday month with relatives and decide about his future, she feels stirrings of old wishes for happily-ever-after. The attraction is mutual, although the last thing Row wants is to try marriage again, plus he’s about as interested in having a family as…well, he isn’t. But then there’s Connor Michaud and his three younger siblings. Oh, no. What now in Christmas Town? After spending the last year trying to get his song-writing career off the ground, Wally MacIver is back in Christmas Town for good. His dreams and ambition didn't bring him anything other than betrayal and pain, mainly at the hand of his boss, record executive Grayling Stanhope. So much for thinking their "connection" was anything other than business. But the last thing Wally expects is to run into Grayling again...in Christmas Town! Grayling fell in love with Wally's songs long before she ever met him. Their attraction and connection was immediate, but divided loyalties and her own insecurities cost her the only man she's ever truly loved. She knows he might never trust her again, but there are some secrets she just can't keep. Somehow, some way, they've got to find a way to move beyond the past: especially now that they're going to have a baby. Dylan King never intended to get involved with Christmas Town. He'd arranged his business trip to include a short visit with his Aunt Odette. But now he's fixing furniture for Over the River Retirement Home residents, welding a fence for the carousel and extending his stay every other day. If he stopped making up excuses to spend more time with Sadie Kent, he could finally get back to business like he wanted. Sadie Kent has fallen to a new low. Not only has she ditched Santa School (a birthday gift from her young daughters to regain her Christmas spirit after her holiday divorce last year), Sadie has seriously embellished her culinary skills. Between keeping her volunteer commitments and trying to find a job that won’t interfere with her daughters’ school schedules, baking and decorating Christmas cookies to help raise money for the carousel refurbishment might be one step too far. 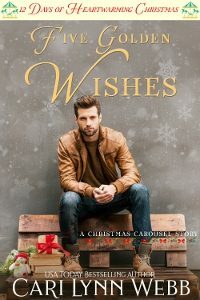 If Dylan King stopped offering suggestions and distracting her, and reigniting her holiday spirit, Sadie could prove she had everything under control. Welcome back to Christmas Town where wishes in the heart, no matter how deep they're buried, find a voice. And the power of family and love endures.